Few church communities are comprised of a single congregation, and yet when developing new expressions of church many struggle to build good relationships between existing and new. Despite a typical church having an early morning service, an evening service, a midweek service and a main Sunday gathering. frequently new forms of church are treated differently. Flowing forth; emanating or issuing from or as if from a source. Intentional - discerning, listening and acting. Missional - a part of God's Mission, living numerical and spiritual growth. Expectant - believing God intervenes and speaks. Here are three simple principles to enable healthy relationships and growth in the relationship between an EFC and the existing structure. A new community needs a culture of engagement with the wider structure of the church. This does not mean a culture of conformity, but stands in contrast to a culture of opposition. It makes sense that a new community draws from the resources offered by the existing structure in terms of finance, safeguarding and legal governance. It is long term counter productive to hide these resources, or their costs. In a church with multiple expressions key relationships need to be built between those different expressions. Ideally these relationships will happen organically, but it may be they need to be encouraged and invited. They should ideally go beyond members of a PCC or trustees. It may be impossible to have relationships between every expression in a particular context, but degrees of separation should be minimised. The oversight bodies of the church should be diverse and reflect the different expressions that exist within the church. Does the PCC have a representative who can speak with confidence for each expression of church? Replicating oversight structures should be avoided. 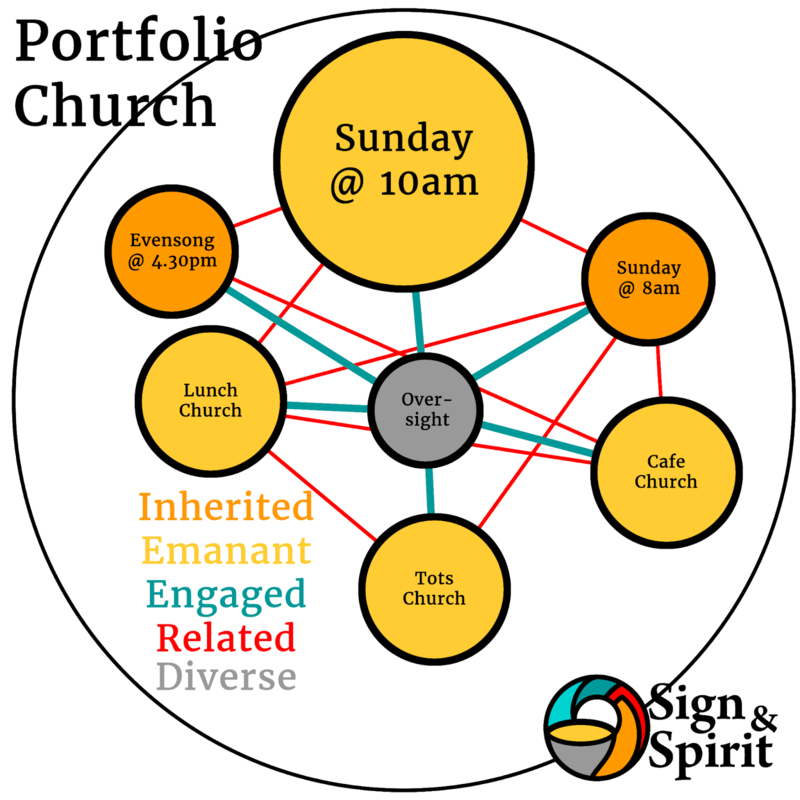 What can develop in such a context is a new form of Parish ministry: A single church structure providing oversight for a portfolio of emanant communities and gatherings. The role of that oversight is to curate and enable rather than dictate exact forms, although a communal missional vision is key. This is not a case of consumerist church, as each community has its own identity, integrity and mission focus. The intention is to reach people with the message of the gospel where they are rather than market to existing groups of churched people. Parishes have been doing this for many years, with services in nursing homes and schools for example. The challenge is to take that method and recognising that it is central rather than periphery to the essences of local church. Portfolio ministry sits well with the models of Jesus Shaped Missional Leadership.